Why are we still using Mercator Projection? My friend, Kris, shared a short video on my facebook timeline about how inaccurate most maps are. If you have studied geography extensively, you might know this: Most [commerical] maps use Mercator projection which falsely depicts certain areas on the map larger or smaller than they actually are. The Mercator Projection widely used today was created in the16th-century by Gerardus Mercator, a Flemish cartographer. Unfortunately (or fortunately) for me, Kris shared this video with me just as I was preparing to go to bed. I ended up staying up all night doing some research (un-brainwashing my brain) from the LIES I've been told all my life. I once saw a post about something like this on facebook, but it never clicked until now. For starters, in the image above, consider how big North America appears to be in comparison to Africa. One would be prone to assume that Africa is considerably smaller in terms of area. Better yet, consider how big Greenland is; about the same size as Africa. The fact is, Africa is 14 times as big as Greenland. This problem is known as The Greenland Problem. Furthermore, all of North America & Greenland would both fit in Africa, with room to spare. Discovering all this not only makes me question the education system but ask why big corporations like Google still use the ancient Mercator projection in their technology. Google Maps uses the traditional Mercator system. The National Geographic Society seems to be the only group (that I know of) taking steps forward and abandoning the 500-year old Mercator Projection. They use the Winkel tripel Projection system, which is neither area-equal (like the Peter Projection) nor conformal (like the Mercator projection). I know, based on my "research" that reproducing a 3D map on a 2D surface is difficult. I also know that technology is (and has been for a while) at a place where we can reproduce a map projection more accurate than the traditional Mercator system. So, it would appear that we have simply chosen to live in ignorance instead of fixing an obvious problem. A problem that exaggerates the size of objects near the north and south pole (USA, Russia, etc) and reduces the size of objects near the equator (e.g. Africa). Could the cause of this problem be White Supremacy? Maybe. But that's a whole other story. There are a few questions that need to be raised. 1. Why does Mercator Projection show the sizes of countries/continents incorrectly? I couldn't answer this question any better than G.D did on this article on The Economist. 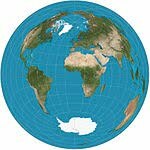 "One of the Mercator projection’s fiercest critics was Arno Peters, a German historian. He reckoned that the widespread use of Mercator out of the thousands of projections available was a sign of bias. In Peters’ view, the Mercator projection was preferred because it exaggerates the size of northern European countries to make them appear more powerful when set against their conquests in the southern hemisphere. His solution, a modified projection known as the Galls-Peters projection, preserves area." Another answer to this question is that this exaggeration of objects at both the north and south pole (making them appear larger than they actually are) is as a result of the difficulty in accurately representing a sphere on paper. 2. Why aren't more people using Universal Transverse Mercator Coordinate System? This projection (also known as UTM projection) is a variant of the traditional Mercator projection. UTM is used by the military. Why this more accurate projection of the world map is not being used to educate us is a mystery to me. 3. 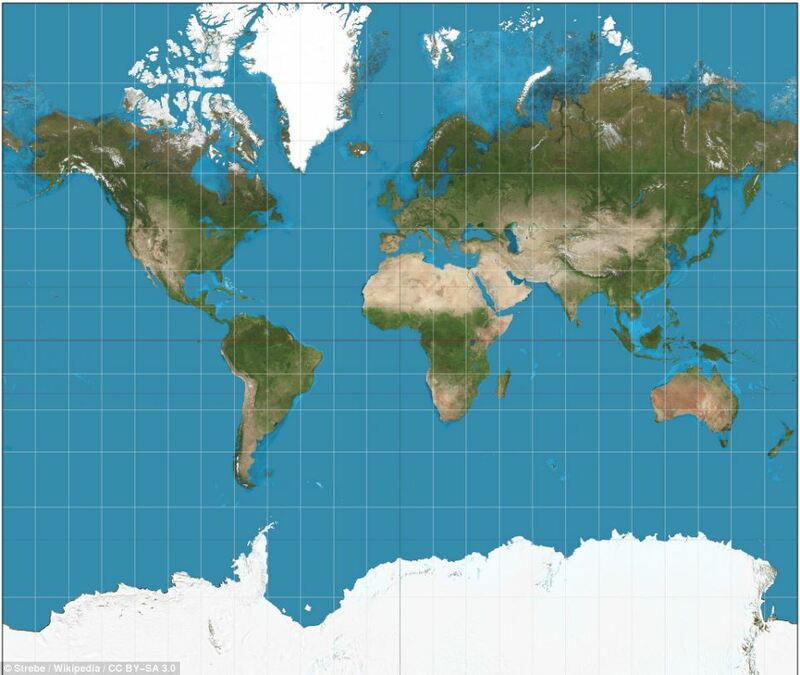 Why is Antarctica so big on the world map? The simple answer is this: because the Mercator system depicts it that way. See question 1. You see how gigantic Antartica is? Antartica is maybe 3 times the size of Australia and maybe about 2/3 the size of Africa. This problem can be called The Antartica Problem. There are tons of map projections. 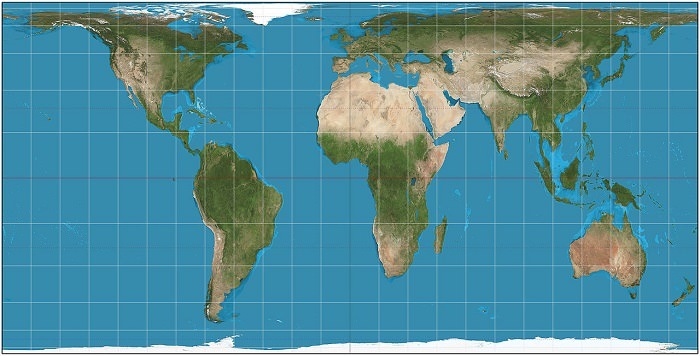 The best map projection depends on what you want out of that map, but there are many maps that now serve more than one purpose. Hobo-Dyer Projection: It's the most aesthetically pleasing map of all I've seen. It's the grown-up brother of Peter's projection and Robinson's projection. Azimuthal Projection. It's pretty cool; check it out. 5. Any other map projections worth looking at? I discovered many more interesting Map projections from this list on Wikipedia. http://www.thetruesize.com - Compare the size of different countries to each other. a. Why is the traditional Mercator projection system still being used by Google and others? b. Is the education system silently brainwashing us into holding white supremacist behavior? See question 1 above for a brief reminder.